We have a bit of small-scale eye candy this afternoon. Jonas Dahlberg has sent us some pictures of his impressive 2mm WW2 layouts, featuring the Battle of the Bulge, D-Day landings and a really nice pacific island – I especially love the snow-covered industrial zone. Enjoy ! There are an awful lot of cliches one can use when publishing anything related to the RAF ! Based on buildings at various RAF Fighter Command bases, the set is ideal for anyone playing Battle of Britain games or even cold war missions. We’re pretty sure that it’ll find its way into various Aeronef or Land Ironclads VSF games as well as something called Dystopian Wars (we’re not absolutely sure what this is, we’ve heard that it’s some inferior, niche market version of Nef/LI 😉 ). Coming soon we have a T2 hangar which you can use to expand your airfield and cater for larger aircraft. News just in – Shapeways are having a sale on their White, Strong and Flexible material (a rough-finish white nylon). From now until August 6th, you can get 10% off using the code rah1v. So if you fancy our recent Chain Home WW2 radar set, some 15mm Moisture Collectors or 6mm Power Pylons, or any of our plethora of WW2 Normandy houses, now’s the time to buy. We’ve updated our Shapeways Store with a number of new items recently – not all of these are on our website yet, so you’ll need to straight to Shapeways website to see them. These include more of the items from the Pegasus Bridge game, including the Vorpostenboot with which I had so much ‘fun’, more houses and a rather nice farmyard. There’s also an odd subject, a small (scale unspecified) model of a bridge (based on the design of Long Bien bridge in Vietnam) which we produced for a friend to use as a ground target for Vietnam-era aircraft games. Over on the Maidstone Wargames Society site we’ve updated the Pegasus Bridge page with photos of the game in action at Broadside last weekend. Anyone following the saga of the Maidstone Wargames Society Pegasus Bridge game will be aware that one of the items needed is a German Vorpostenboot (literally ‘outpost boat’). No model of this is available in 1/300th scale, I once again went down the 3D printing route and created a computer model which we shipped off to Shapeways. The finished model has come back and once again we’re more than pleased with what we received. The model was equipped with a selection of AA weapons from Heroics and Ros (thanks to Andy at H&R for sorting out something for the main gun !) and hurriedly painted for a run through of the game last weekend. The model still needs finishing with detail painting and ink washes. If there is time I’d also like to give it a crew, but I suspect that pressures of finishing the rest of the models will count against me there. Building a bridge … at last ! The model is already on the painting table, ready for installation on our gameboards in the next week or two. There are also a bunch of other new items ready for our Shapeways store, but I’ll save those for later this week – I thought Pegasus deserved an entry all of its own. 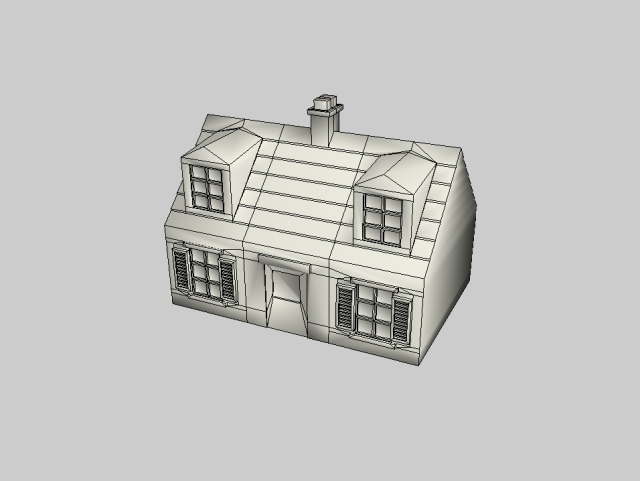 If you want your own, the model is available for sale now in our Shapeways store. If anyone wants to pick one up at Salute, e-mail us by the end of this week (March 31st) and we’ll ensure one is waiting for you. The two Normandy buildings are more variations on a similar theme, as I strive to make enough variety to cover my Pegasus Bridge table. All of the buildings in our range are based on real ones that I photographed while on holiday. Now for the water towers. First, we have a fairly straightforward concrete ‘mushroom’ tower, based on the Roihuvuori one in Helsinki, Finland, although much scaled down – the real thing would be be about 6.5″ high at 1/300th scale ! Next up is a spheroid tower, based this time on one at Darwin Airport. Finally, and my personal favourite, a British 30s water tower based on one at Tilehurst near Reading, complete with a first floor viewing gallery ! We’ve also been through our entire Shapeways store and reviewed our pricing. In the process we’ve knocked a little bit off the price of just about all of the models, so they’re even better value now. 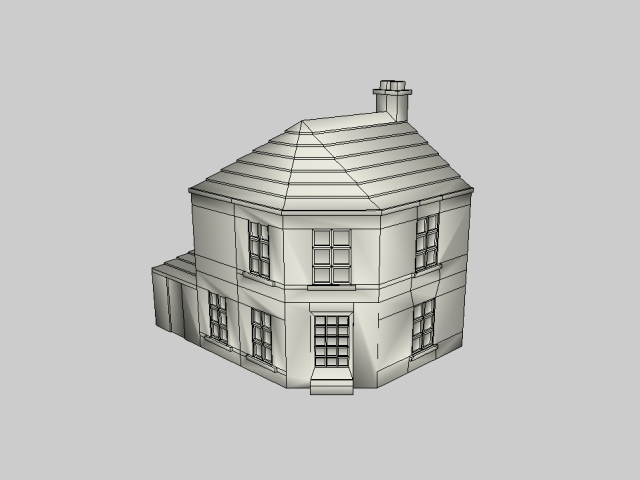 We have an ever-increasing number of 3D models on our Shapeways Store which are printed to order – we don’t generally hold any stock. However, if you want to avoid postage costs, we are taking advance orders on these models to be collected at Salute 2012 – just e-mail us a list of your requirements. We will then order these from Shapeways, and you can collect them on the day. Because of the lead-time on Shapeways production, we must have any orders by the end of Sunday April 1st at the latest. 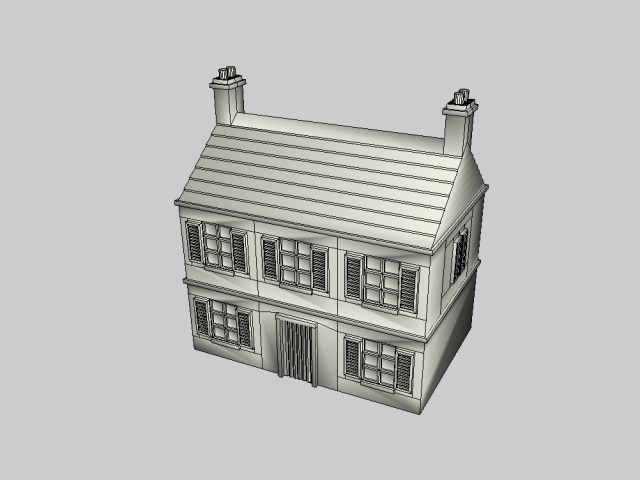 You can either pay in advance or on the day – but please note that we can’t offer any discount on Shapeways items. You will be able to see many of our Shapeways creations on the day at the Maidstone Wargames Society Pegasus Bridge game. Some of you may have been following my 6mm Pegasus Bridge project for Maidstone Wargames Society (if you’re coming to Salute, be sure to pay it a visit). 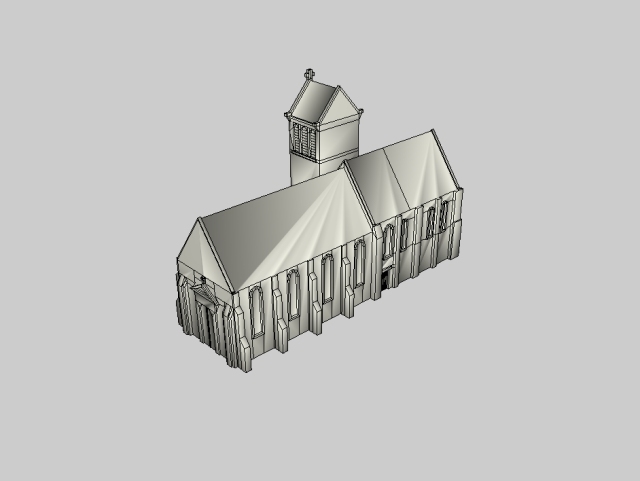 Many of the buildings and structures for this have been created as 3D computer models and printed out by Shapeways. Today we’re previewing a few more of these designs, which will be making their way into our Shapeways shop when we have had prototype prints back (due in the next few days, in case you want to check back then …). 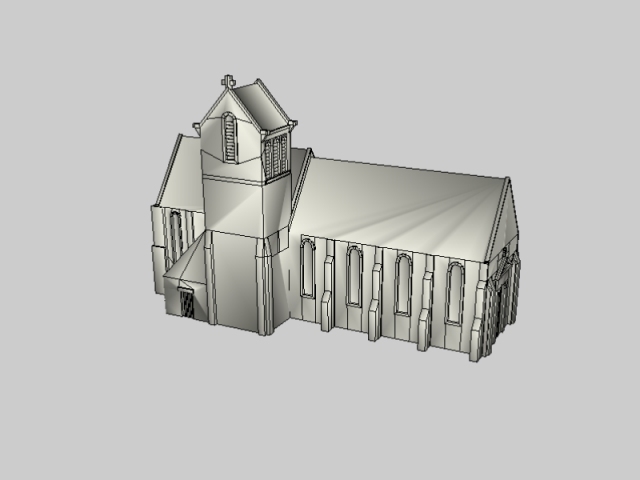 The largest model by far is Benouville Church – this famously received a PIAT round through the tower on D-Day, as it was being used as a vantage point by German snipers. Apart from the church, most of this batch are all general-purpose houses that would serve for most regions of France (and probably a greater part of Western Europe, including Belgium, Holland and Germany). 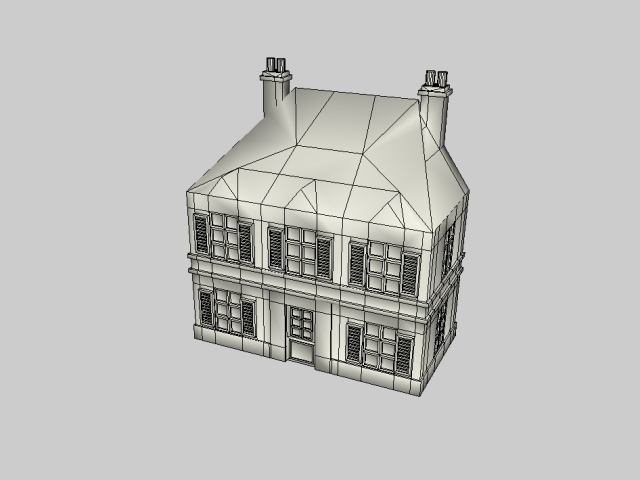 By careful design of the models (keeping the amount of material used to the absolute minimum), we think we can set the prices for these so that they are competitive with resin buildings of a similar size.